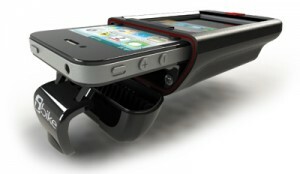 I had the opportunity to review the iBike Phone Booth, a bike mount for the iPhone, and iBike Coach, a cycling computer app for the iPhone. I installed the unit on two of my road bikes. Fearful that it would get destroyed on extreme trail rides, I opted not to test it on either of my mountain bikes. First I installed it on my Raleigh road bike, and it was a challenge. While I was supplied with rubber pads to help get a good fit and prevent scratching, I found myself lacking a third or fourth hand, which would have eased the process of fitting the mounting screws into their holes to piece the unit together. Installation took me about half an hour and afterwards, I was exhausted. I later installed the unit on my primary road bike, a Kona Jake. This time, I had it mounted in under 10 minutes, and was much less stressful. I found the unit easy to use, and it was easy to read the display through the clear plastic protective case. However the button on the case that provides access to the home button was a little stiff, and sometimes I had to press it repeatedly to get my press to register – not the kind of thing you want to be trying while biking at high speeds (so don’t do this)! The light sensor was blocked by the case, which, when Auto Brightness was enabled, resulted in the screen frequently going so dark as to make it impossible to see, so I had to remember to adjust the brightness prior to inserting the phone into the case. Inserting and removing the case was simple, and it stayed securely latched in all of my tests. I rode once in a light rain, and my iPhone stayed perfectly dry. The Phone Booth includes adapters to allow you to use it with an iPod Touch (generations 1-4), and iPhones 3-4S. I like the iBike software (free in the app store). The program lets you configure your bike (and rider) so as to get a more accurate reading of the amount of work you do, i.e., calories you burn, during your rides. It is very intuitive, and easy to start, stop, and then review your rides. While on a ride, the display shows you the number of calories you burn, your ride time, distance, current, average, and max speeds. The display also periodically automatically toggles to show your decent and ascent, so you can tell if you are climbing or falling and at what grade. The software also includes iPod controls, so you can control the music you are listening to, but I opted not to use these and instead used the controls on my Bluetooth headset, as this allowed me to continue to watch the road instead of staring at the handlebars. Once you’ve finished your ride, you get to see the final report, which includes the total distance ridden, elapsed time, ride time, max speed, average speed, and a map of your travels. On two of my test rides in Boston, the map was completely off, positioning me somewhere in eastern Florida and the ride time was way off. In all of my other uses, however, I found the reading to be pretty much in line with what I expected. You also have the option to send your ride to Strava to store your ride there, and a gift certificate for the paid version of Strava is included with the unit. I did not try this service. While I did like the Phone Booth, the button stiffness and brightness issue did make it a little less than perfect. The iBike Phone Booth retails for $59 from the iBike website. iBike Coach is available for free in the iTunes App Store.